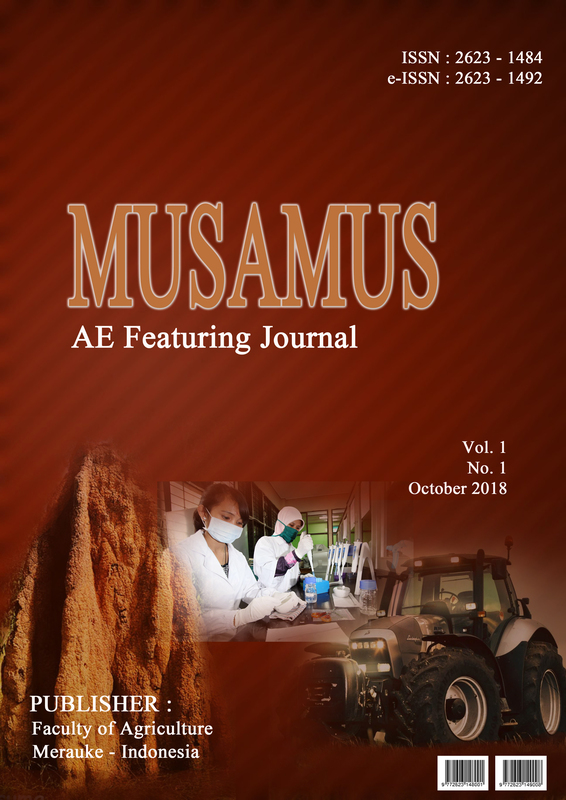 Musamus AE Featuring Journal is a peer-reviewed journal published by faculty of Agriculture Musamus University, Merauke, Indonesia. Musamus AE Featuring Journal published twice a year (October and April) available in electronic and printed version. Hence, we are welcome submission paper in English or Indonesian language. Musamus Journal of public administration (MJPA) is a peer-reviewed journal published by the Department of administration, Faculty of political science, University of Musamus, Merauke, Papua, Indonesia. MJPA is published twice a year (October and April) is available in print or electronic versions. Therefore, we welcome the sending of paper in the United Kingdom or Indonesia language. the focus of the study on the management of public policy and management of the public service. Musamus Devotion Journal (MDJ) is a peer reviewed journal published by Departement of Research and Devotion (LPPM), Musamus University, Merauke, Indonesia. MDJ published twice a year (April and Oktober) available in electronic and printed version. Hence, we are welcome submission paper in English or Indonesian languange. 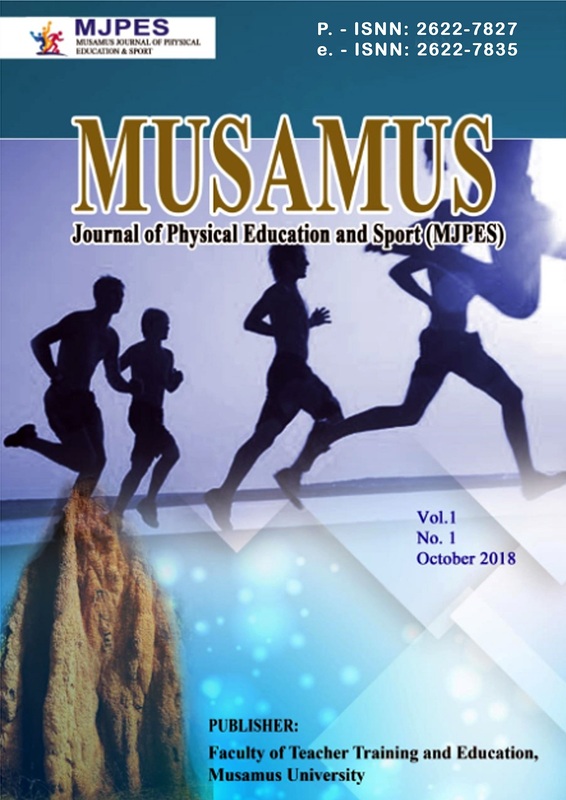 Musamus Journal of Physical Education and Sport (JPES) is a new series of the previous journal, Citius Altius Fortius - Journal of Physical Education and Sport (p-ISSN: 2622-7827, e-ISSN: 2622-7835). The Journal of Physical Education and Sport is now a registered trademark (all rights reserved). MJPES is a peer-reviewed scientific journal that provides open access to its content and publishes 2 issues per year. All published articles are accessible in PDF format free of charge. Musamus Journal of Primary Education (MusJPE) is a peer-reviewed journal published by Faculty of Teacher Training and Education, Musamus University, Merauke, Papua, Indonesia. 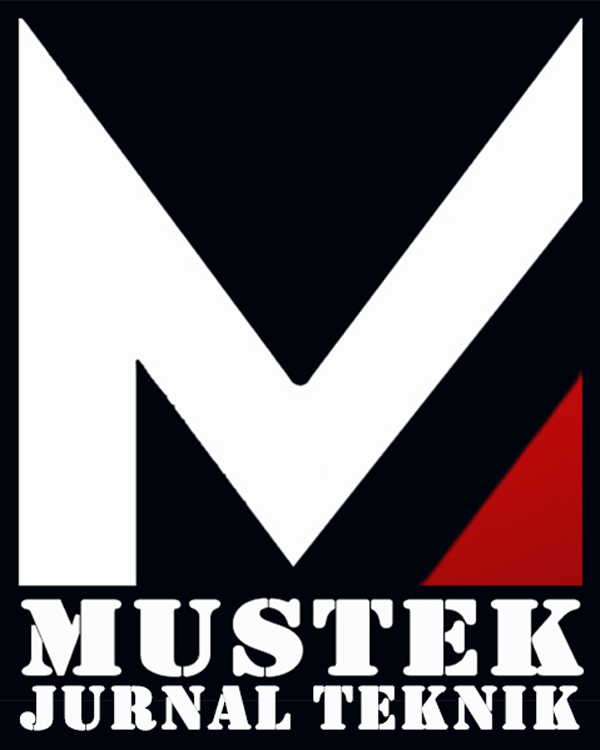 MusJPE published twice a year (October and April) available in electronic and printed version. Hence, we are welcome submission paper in English or Indonesia language. Musamus Journal of Science Education (MJOSE) [p-ISSN 2622-7851 | e-ISSN 2622-786x] publishes a scientific paper on the results of the study and review of the literature in the sphere of natural science education in primary education, secondary education and higher education. Additionally, this journal also covers the issues on environmental education and natural science. 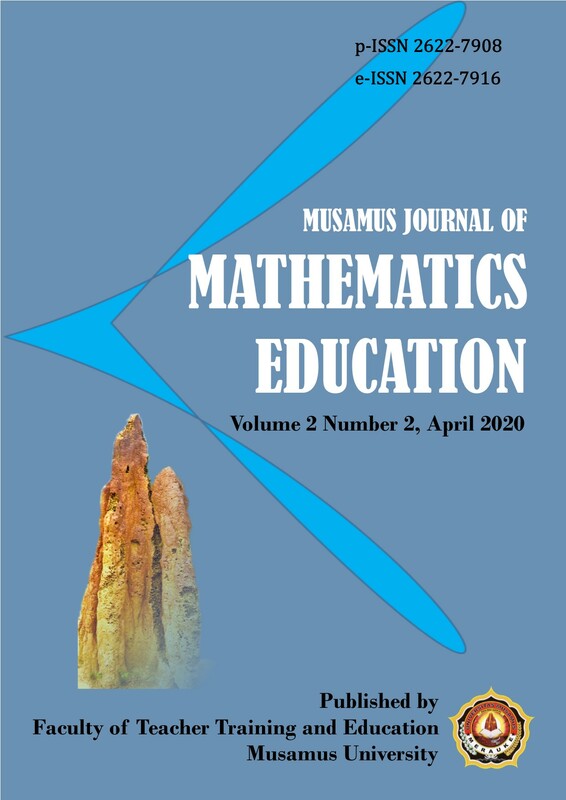 Musamus Journal of Mathematics Education (MJME) is a peer-reviewed journal published by Faculty of Teacher Training and Education, Musamus University, Merauke Papua Indonesia. MJME is published twice a year (October and April) available in electronic and printed version. Hence, we are welcome submission paper in English and Indonesian language. Musamus Journal of Language and Literature (MuJoLaLi) is a peer-reviewed journal published by Faculty of Teacher Training and Education Musamus University. This journal is available in print and online and highly respects the publication ethic and avoids any type of plagiarism. MuJoLaLi Journal is published twice a year in the months of October and April; it publishes manuscripts within the fields of Language Education, Literature, Linguistics, Culture, Arts. 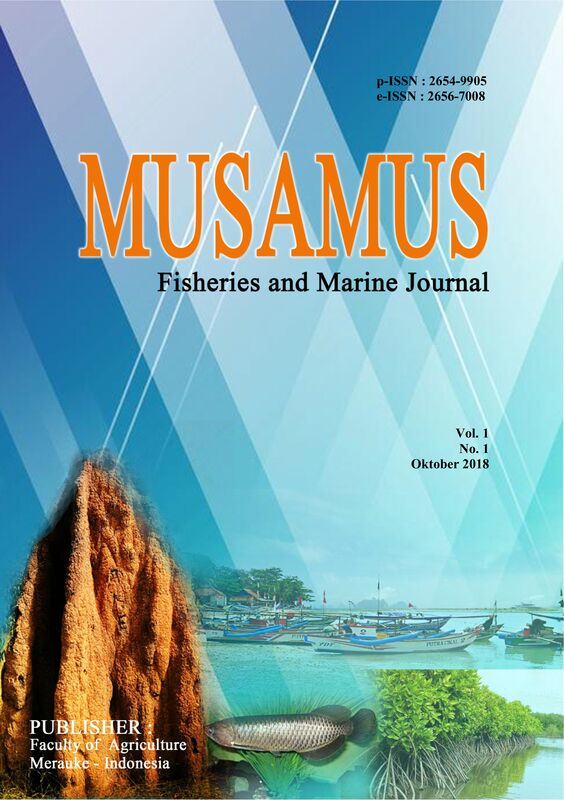 Musamus Fisheries and Marine Journal is a peer-reviewed journal published by faculty of Agriculture Musamus University, Merauke, Indonesia. Musamus Fisheries and Marine Journal published twice a year (October and April) available in electronic and printed version. Hence, we are welcome submission paper in English or Indonesian language. Musamus Journal of Agrotechnology Research is a peer-reviewed journal published by Agrotechnology faculty or agriculture musamus university Merauke Indonesia. MJAR published twice a year (october and april) available in electronic and printed version. hence , we are welcome submission paper in English or Indonesian language. Jurnal Restorative Justice menjadi wadah bagi akademisi, peneliti dan praktisi dalam menyebarluaskan hasil penelitian. 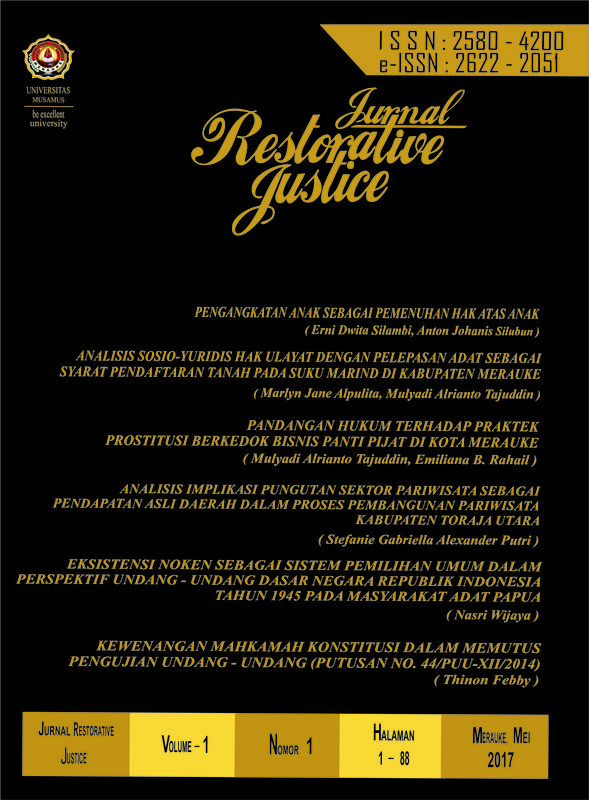 Jurnal Restorative Justice menyangkut kajian hukum adat, pidana, perdata dan tata negara. 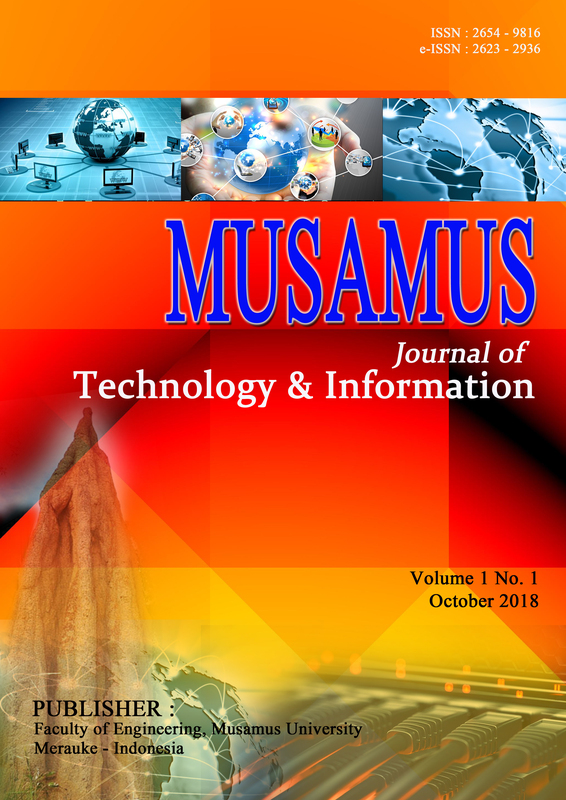 Musamus Journal of Technologi & Information (MJTI) is a peer-reviewed published by Faculty Of Enginering, Musamus University, Merauke, Papua, Indonesia. 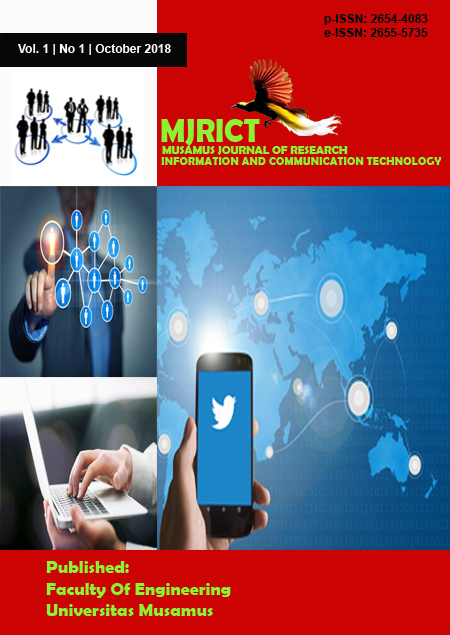 MJTI published twice a year (October and April) available in electronic and printed version. hence, we are welcome submission paper in english or indonesian language. 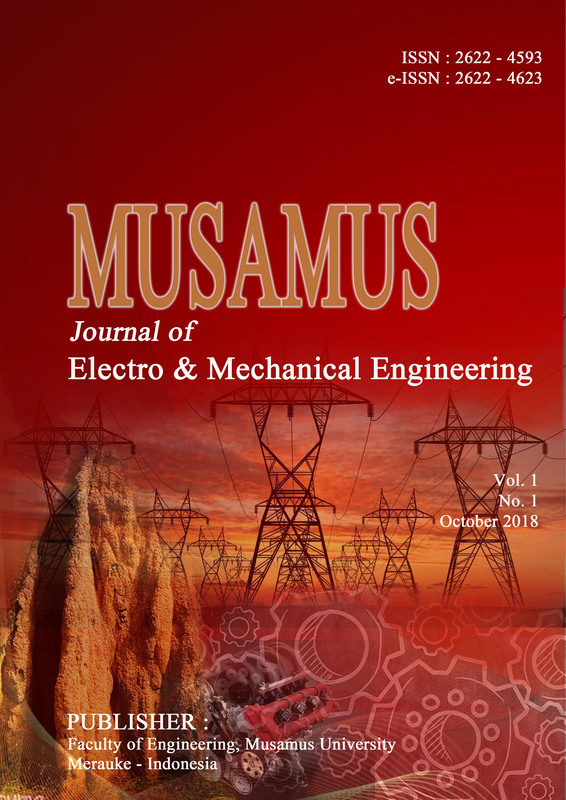 Musamus Journal of Electro & Mechanical Engineering (MJEME)is a peer reviewed journal published by Faculty of Engineering, Musamus University, Merauke, Papua, Indonesia. MJEME published twice a year (October and April available in electronic and print version. Hence, we are welcome submission paper in English or Indonesia language. Musamus Journal of Civil Engineering(MJCE) is a peer reviewed journal published by Departement of Civil Engineering, Musamus University, Merauke, Indonesia. MJCE published twice a year (Oktober and April) available in electronic and printed version. Hence, we are welcome submission paper in English or Indonesian languange. Welcome to the official website of Musamus Journal of Architecture. Musamus Journal of Architecture is a peer-reviewed journal published by Architecture Department, Faculty of Engineering, Musamus University, Merauke, Papua, Indonesia. Musamus Journal of Architecture is published twice a year (October and April) available in electronic and printed version. Hence, we are welcome submission paper in English or Indonesian language. 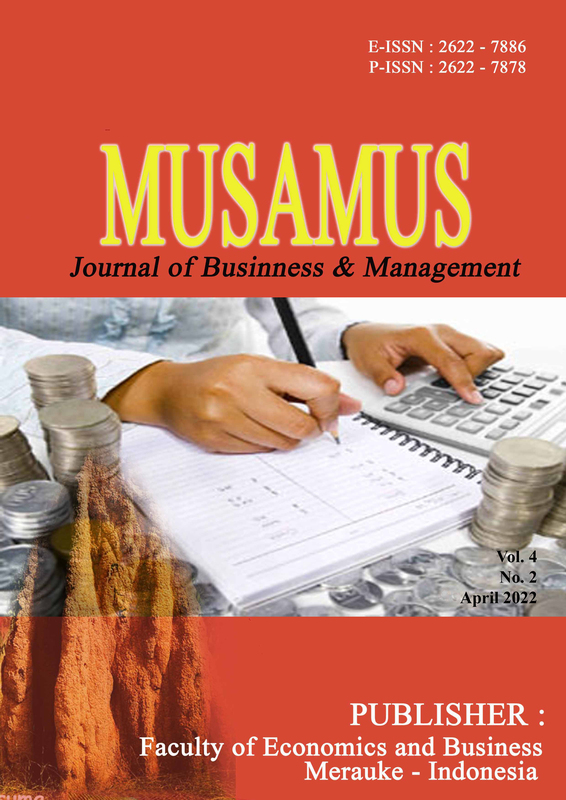 Musamus Journal of Business & Management is a peer-reviewed journal published by Faculty of Ecconomics and Business, Musamus University, Merauke Papua Indonesia. MAJ published twice a year (October and April) available in electronic and prited version. hence, we are welcome submission paper in English or Indonesia language. 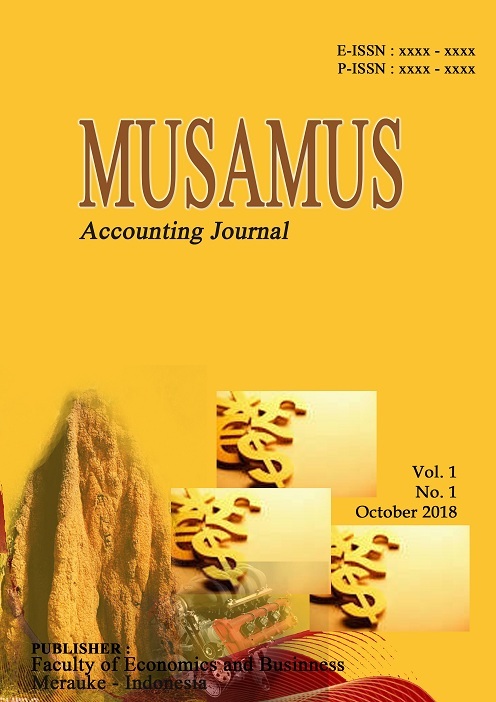 Musamus Accounting Journal (MAJ) is a peer-reviewed journal published by Faculty of Ecconomics and Business, Musamus University, Merauke Papua Indonesia. MAJ published twice a year (October and April) available in electronic and prited version. hence, we are welcome submission paper in English or Indonesia language. 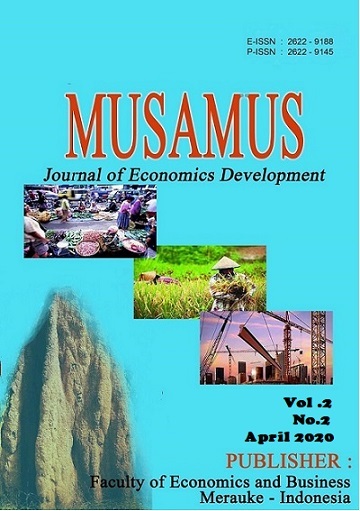 Musamus Journal Of Economics Development (MJED) is a peer-reviewed journal pulbished by Faculty Of Economics and Business, Musamus University, Merauke, Papua, Indonesia. Musamus Journal Of Economics Development (MJED) Published twice a year (October and April)available in electronic and printed version. Hence, we are welcome submission paper in English or Indonesian Language. 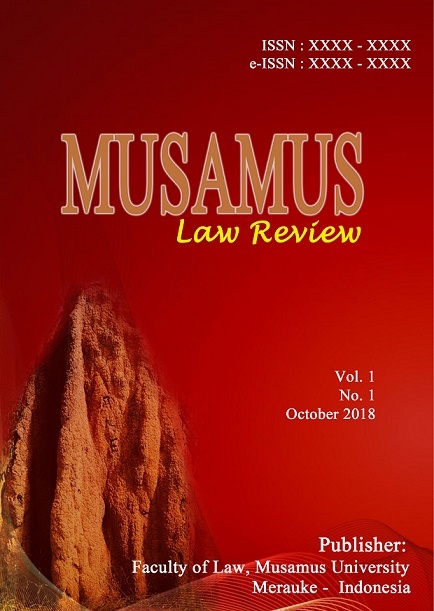 Musamus Law Review (MuLaRev) is a peer-reviewed journal published by Faculty of Law, Musamus University, Merauke, Papua, Indonesia. MuLaRev published twice a year (October and April) available in electronic and printed version. Hence, we are welcome submission paper in English or Indonesian language. 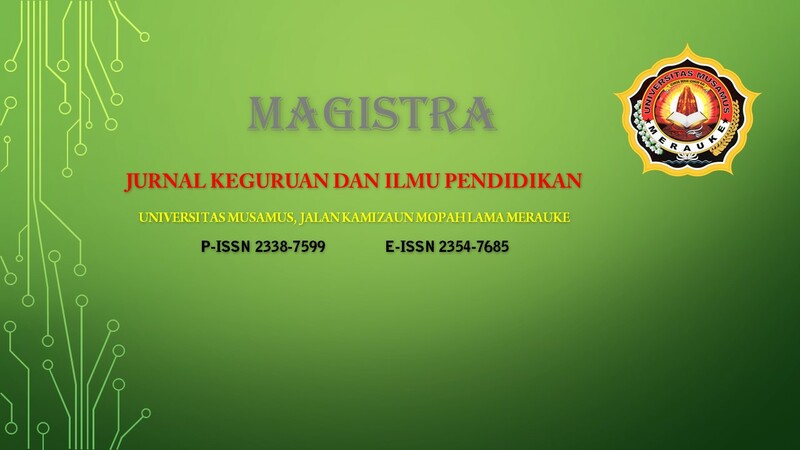 MAGISTRA: Jurnal Keguruan dan Ilmu Pendidikan FKIP Universitas Musamus Merauke (p-ISSN 2338-7599 e-ISSN 2354-7685) adalah terbitan ilmiah yang berisi artikel hasil penelitian, hasil pemikiran kritis, atau kajian dan aplikasi teori di bidang keguruan dan ilmu pendidikan. Diterbitkan dua kali setahun (Januari dan Juli). Jurnal Imu Ekonomi & Sosial (p-ISSN: 2085-8779; e-ISSN: 2354-7723 published by the Faculty of Economics and Business, Musamus University, Merauke. The journal is a peer-reviewed published twice a year (April and October) which contains scientific on the results of critical thinking or research in various topics include of management, accounting, economic development, and social science.